Tuy Hoa is the capital city of Phu Yen province, which is situated in the south-central Vietnam. The city lies to the east of Phu Yen province. It shares the common border with Tuy An district on the north, with Tuy Hoa district on the south, with Phu Hoa district in the west, and with the East Sea on the east. The city has a coastline of over 10km long. Tuy Hoa city is the center for commerce, services and transportation of Phu Yen. It also has the most crowded population in the province. Tuy Hoa city comprises a total area of 65 km2 with many scenic beauty spot such as Da Rang River and Nhan Mountain, Ghenh Da Dia.......which constitute a well-known tourist attraction. 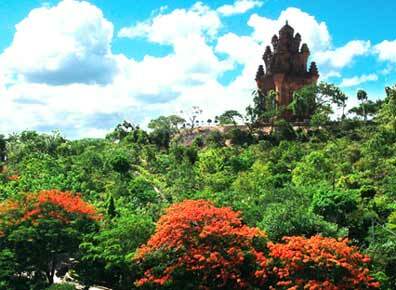 Additionally, you can also visit a system of pagodas namely Ho Son, Hoa Son, Minh Son, Khanh Son, Bao Tinh, Bao Lam, Kim Cang. Ghenh Da Dia lies within the area of Tuy An district, Phu Yen province. This is a special beauty spot comprising many large rocks evenly rising up in their pentagonal shapes; each layer continuously lapping next to one another on a large scale. View from distance, this site looks like a giant beehive. The closer view will make you think of piles of cups and plates in ceramic furnaces. From Phu Yen, there are various ways to transfer to Ghenh Da Dia. The first option is traveling along the National Highway No.1, about 30km towards the north. Upon reaching Chi Thanh town, turn right and continue to drive about 12km to the east. The second option is traveling by waterway (which takes about 1-2 hours) from ward 6’s port, Tuy Hoa city. Most tourists choose to travel by waterway since they can enjoy the fascinating scenery along the way with islands, beaches. Ghenh Da Dia lies close to the seashore. The first impression upon reaching the destination is black rocks lying next to one another looming in continuous blue waves. It seems that there is a magic hand which has arranged such wonderful beauty spot. The pieces of rock are not just shaped like pentagons, but also have other shapes such as hexagonal or round ones. According to initial research, Ghenh Da Dia is formed during the operational process of a volcano on Van Hoa highland (Son Hoa), about 30km away from the destination. Visiting Ghenh Da Dia, tourists not only have chance to enjoy the untouched beauty of the rocks, but also to relax on a beautiful beach, which lies to the south of Ghenh Da Dia. The 3km-long beach is featured with crystal clear water and purely-white sandy beach. Nhan tower is situated near Nhan Mountain, on the northern bank of Da Rang River, close to National Highway No.1A in Tuy Hoa City, Phu Yen Province. The tower was constructed on a rather flat area near Nhan Mountain. Nhan tower features a quadrilateral shape with four stories of the same style, and the higher one is smaller than the lower ones. This is a 25m high tower with 11m long foot tower. There are no decoration patterns on the tower walls. The central arch is decorated with a monster’s head on its top. This is a special tower top which is created by the harmonious combination of the image of Linga (often worshipped in tower of Cham people) and the image of the spire. Da Bia Mountain or Thach Bi Son is a well-known mountain in Phu Yen, which has been recognized as a national beauty spot in 2008 by the Ministry of Culture, Sport and Tourism. The mountain is attached with many legends and old stories about important persons and events in Vietnam’s history in general and Phu Yen’s history in particular. Da Bia Mountain also plays an important role in the spiritual life of local people (former Cham people and Phu Yen’s current ethnic groups). The image of Da Bia Mountain has come into many well-known poems, literature works as well as in ancient stories and songs, etc. which have been existed through generations, reflecting many aspects of their daily lives. It proves that, Da Bia Mountain has long been the meaningful symbol, which is highly appreciated by local people during the process of protecting and developing the homeland. Along with the cultural-historical values, Da Bia Mountain is also a beautiful tourist attraction with fascinating scenery, fresh atmosphere, and diverse eco-system. Da Bia Mountain’s peak is the ideal place to enjoy the majestic landscape. Standing on the mountain peak, visitors will have an overview of the giant landscape picture with mountains, river, lake, bay, rice fields, villages and people by the side of the ocean. Conquering Da Bia Mountain is a great opportunity to explore and enjoy the natural landscape, and to understand more about the local land and local people.